Spring and summer collection is inspired by subtle shades and wild flowers, butterflies, light and flowing floral patterns. There sure to be found a dress for every occasion. Flow is part of joy wearing Culotte pants and Josephine dress for twisting and spinning. A must have. As it gets hot your children will love the lightness of our summer dresses HOT DAY and Petit Fleur. To our Classical collection we have added beautiful white and soft ecru dresses just for that Special Occasions, Communion and Bridal Flower girls. All made from luxuriously soft , lightweight cotton. We created beautiful flower names just for those special occasions: Blossom, Magnolia, Lili Bells, Petit Fleur. We took our classic vintage charm Simple Me dress , loved by all, and made it available for everyone’s taste. Now you can wear your favourite dress everyday, with each day in different Colour and Pattern. Kids love this dress for it’s unique, creative and playful. Its wash and go. Mix and match, have fun. 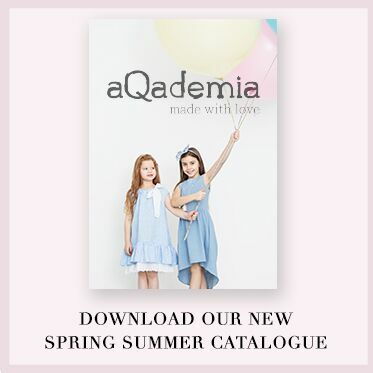 We hope you will enjoy aQademia collection, as much as we have loved designing it for Your little once. After a long, cold winter Our exciting NEW collection is here. Lets Fly its’ all about Harmony and Celebration of life. 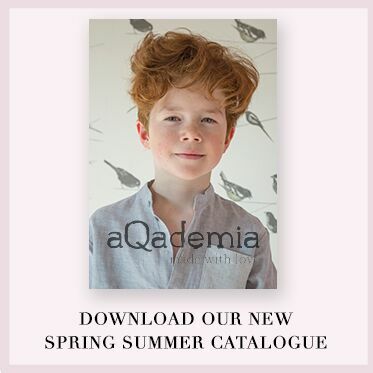 Regardless of style, which your son prefers, in aQademia.eu you will find essencial pieces for boy’s wardrobe. Match and mix gray and blue. Comfortable Anton shorts will ideally work out during the PE lessons, free play at the yard while riding a bicycle or playing football. Universal Gino shirt will add the character to any outfit, depending on the rest of garment. stripe, which we transformed into a fashionable modern look.